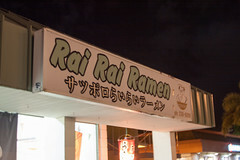 Rai Rai is a modest joint, of about 30 feet square, and having only five tables for guests. Despite that, they seem to do a lot of takeout business, so it wasn’t terribly busy when we visited. 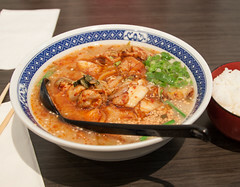 What they lack in seating, they make up for in the menu variety, in that they have a great assortment of ramen dishes, with three different base broths (shio, shoyu, and miso), as well as several variants of these (curry and kimchi ramens, for example), and a good range of katsu meats and gyoza as side dishes. Looking over the menu, we decided to split our order, with Carol getting the Shoyu Ramen, while I ordered the Kimchi Ramen. Both emerged from the kitchen after approximately five minutes. Carol’s Shoyu Ramen was a well-done example of a classic ramen dish: The noodles were spot on perfect, with the exact consistent we both love for our ramen: cooked just enough to have lost a bit of the wheatiness, but still firm and toothly, combined well with a rich and flavorful shoyu broth. A few chunks of flavorful char siu pork and fishcake, and this was a very flavorful ramen, one of the more enjoyable ones we’ve had recently. I did even better with my Kimchi ramen. Built upon a rich and creamy tonkatsu pork base to which kimchi had been added, the result here was one of the most wonderfully delicious and slightly spicy broths I’ve had in a ramen dish—one that was even more rich and flavorful than the wonderful tonkatsu I had a few months ago at Bone Daddies in London. Add in just a little bit of flavorful pork and the same wonderful noodles as the Shoyu Ramen, and this was a thoroughly enjoyable bowl of soup. Overall, Rai Rai has a great thing going on: great quality noodles, several great brothes, good meats, and reasonable prices. I’d be glad to go back for more (indeed, we did, a week later, on one of our last meals before heading back to the mainland). It’s one of the best places to eat on the Windward side of the island.